My latest obsession has been chicken meatballs, I have been making so many batches that I have perfected the recipe. And now I am ready to share it with you. The good news is, if you end up making batches upon batches (like me) you can switch up the sauce and ingredients you enjoy them with! Once you nail the base recipe (at the bottom of the post) you can swap between the other ingredients you serve it with. One of my favorite homemade sauces to make is pesto so I figured why not try mixing them with chicken meatballs. The result – super tasty! I highly recommend this combo. 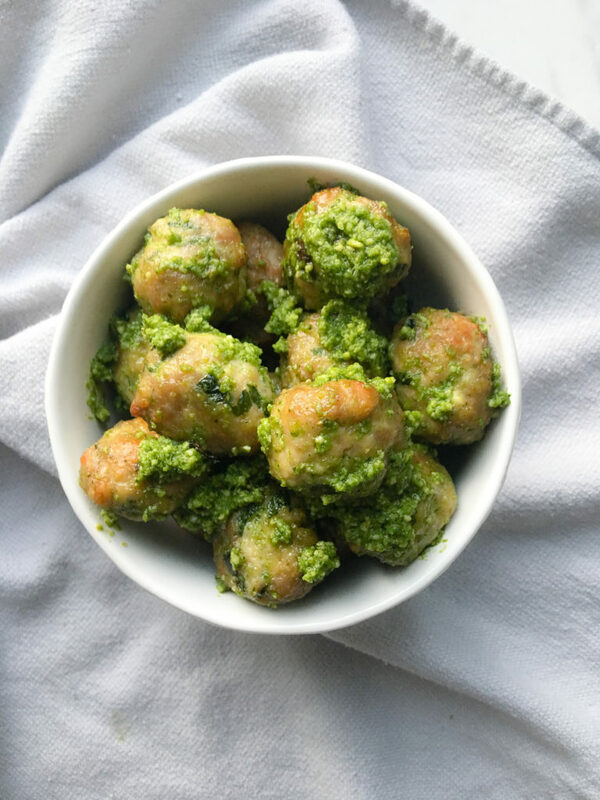 Grab my homemade pesto recipe here and mix with the chicken meatballs as soon as they come out of the oven. 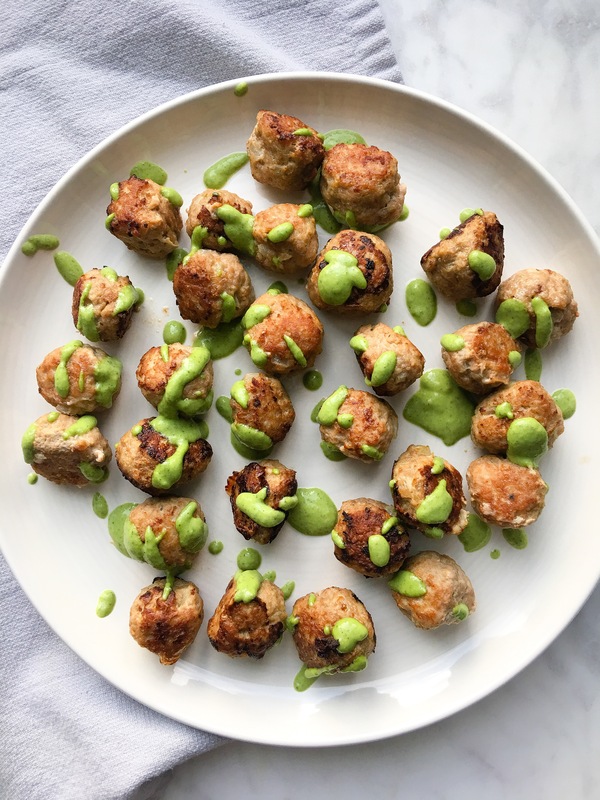 This recipe takes Chicken meatballs with pesto to the next level. I combined it with cashew cream sauce, sautéed zoodles and button mushrooms. This is a MUST try! (You can’t deny the beauty of that swirl). Make my homemade pesto recipe, found here. Make my cashew cream sauce recipe, found here. 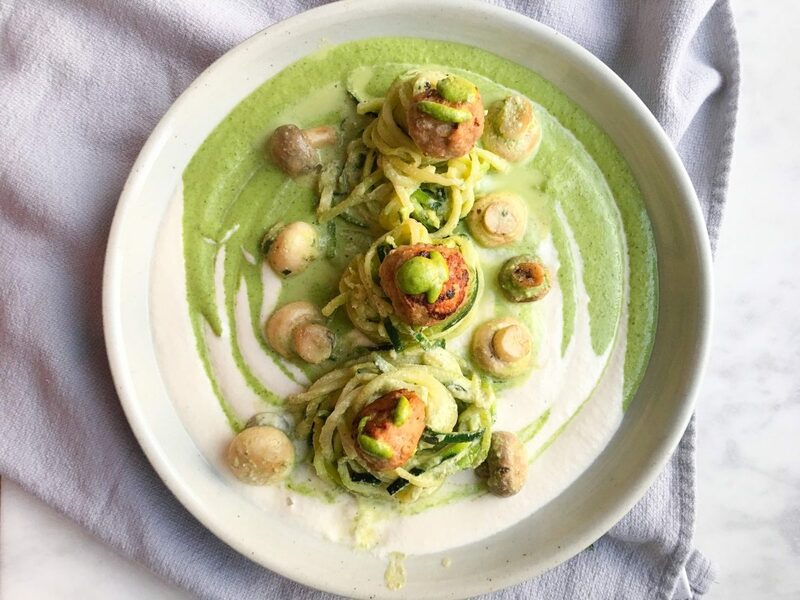 Create a base of both sauces on a plate or bowl (leave extra to toss the zoodles and mushrooms in), use a fork or basting brush to swirl them together. Sautée the button mushrooms in olive oil, salt and pepper until cooked, add zoodles for 3-4 minutes. 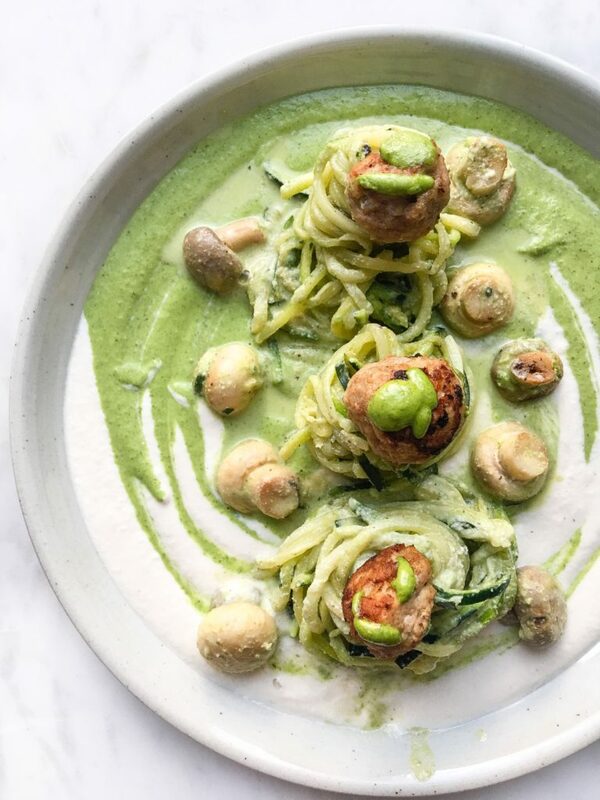 Toss the zoodles and mushrooms in the extra cashew cream and pesto. Place them on top of the sauce base and then top with meatballs. This dish is perfect for the fall. I love the color and warmth of the sauce and it goes so well with simple green beans and brown rice. For the sauce, I blended whole pitted sour cherries that you can buy at Costco or Loblaws then combined it with 1/2 cup of Dianas chicken and rib sauce. Bring the sauce to a boil in a sauce pan, then let it simmer while you cook the rice and beans. Cook the rice according to instructions and steam the green beans. When everything is ready stack the rice, beans and meatballs and top it off with the delicious sauce. I LOVE the combination of ingredients in this pasta, they are unexpected yet go so well together. I originally made it without meatballs but figured they would make a nice addition plus add more protein. 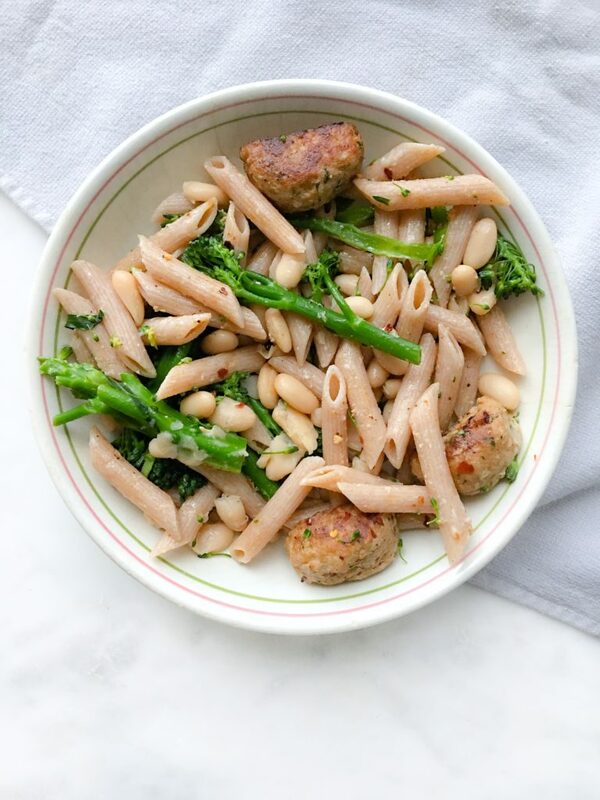 Grab the recipe for the lemon, broccolini, white bean penne here and top it with chicken meatballs using the recipe below! 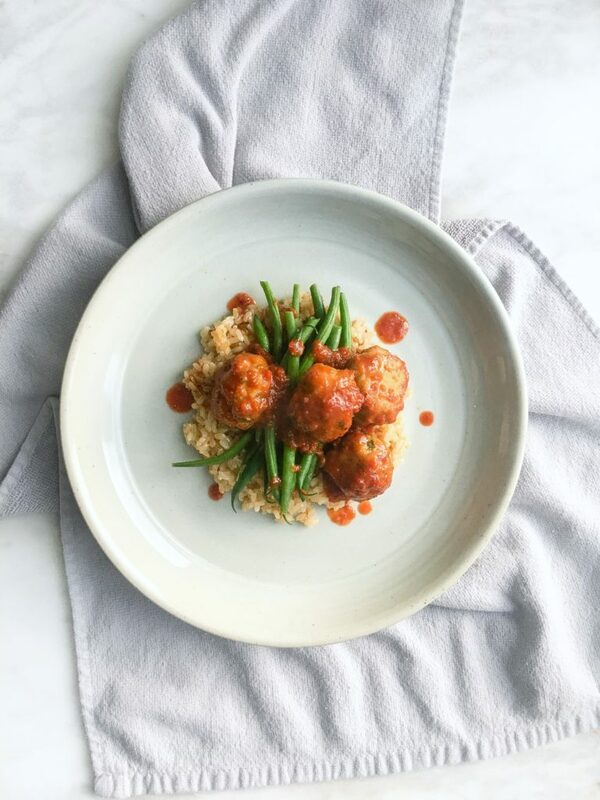 These easy chicken meatballs are super versatile and can be served in several different ways. Use hands to mix everything together until its a consistent blend. Roll the meatballs using a tablespoon scoop of the mixture at a time. Lay a piece of parchment paper on a baking sheet and set the rolled meatballs on the tray once prepared. Place them in the oven for 20 minutes total, flipping them at the halfway point. Cut a fork through the meatballs to check if they are ready. Once ready, enjoy them with plain or with one of the recipes above.